Chojin Club - ZineWiki - the history and culture of zines, independent media and the small press. Chojin Club is a minicomic, graphic art zine or alternative comic magazine from Japan, published by Chojin Books. Chojin Club (bird human club) is an artist collective, based in Tokyo. Chojin Club Vol.1 with comics by Mimi Murai, Akira Nishitake, Shiro Habao, Makiko Nagashima, Kanako Furugori and Youhey Yokota. 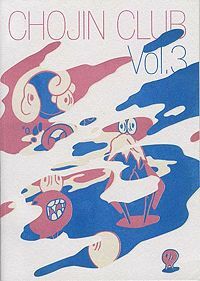 Chojin Club Vol.2 with comics by Mimi Murai, Akira Nishitake, Makiko Nagashima, Kanako Furugori, Youhey Yokota, Anna Sugino, Makiko Yamamoto and Jun Oson. Chojin Club Vol.3 was printed in July 2011 with a print run of 500 numbered copies. Featured graphic artists in Vol. 3: Murai Mimi, Akira Nishitake, Kanako Furugori, Sacha Hommer, Hironaka, Tommi Musturi (Kuti) and Jun Oson. The publication is included in the collection of the St. Patrick's Zine Library. This page was last modified on 22 March 2013, at 10:25.